Bitcoin will be 80.000USD at the end of the year! Bitcoin will be 25.000USD by June! Bitcoin will be 15.000USD this week. There are so many predictions that its difficult to recognize whats true. Luckily, we found the 5 most accurate predictions online. What are the predictors predicting? ´´According to a graph posted by Bloomberg, the 50-day moving average is getting close to the 200-day moving average. If it touches the latter, or worse, goes below it, bitcoin will suffer a great loss. Bitcoin could hit $100,000 in 2018, an analyst who correctly predicted the cryptocurrency's rally at the start of last year told CNBC on Tuesday. ´´Kay Van-Petersen, an analyst at Saxo Bank, added that other rival digital coins could also outperform. NOTE: THIS STATEMENT IS FROM DECEMBER 2017!! What does the trend tell us? 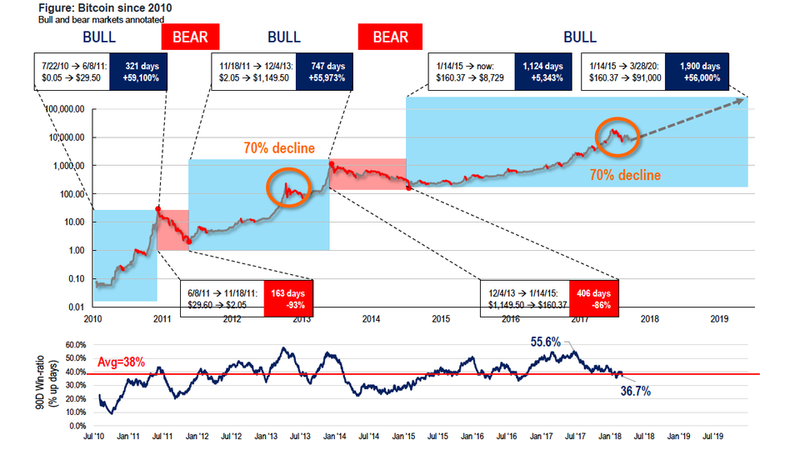 Bitcoin is still in an upward trend since september 2017. If this trend continues we will see bitcoin somewhere between 15 and 20K at the end of the year. But, always remember, we do not have a glass sphere so bitcoin could even hit 100K.